(Nanowerk News) Microwave field imaging is becoming increasingly important, as microwaves play an essential role in modern communications technology and can also be used in medical diagnostics. Researchers from the Swiss Nanoscience Institute and the Department of Physics at the University of Basel have now independently developed two new methods for imaging microwave fields. Both methods exploit the change in spin states induced by an applied microwave field, as reported by the researchers in the New Journal of Physics ("Widefield microwave imaging in alkali vapor cells with sub-100 µm resolution" and "Nanoscale microwave imaging with a single electron spin in diamond"). Philipp Treutlein's group images the microwave fields using a thin glass cell filled with rubidium vapor. If a microwave field is applied in the vicinity of this glass cell, it causes a change in the spin state of all the rubidium atoms in the measuring cell. The rotation of this spin depends on the field strength of the microwaves that are applied. The researchers use a specially developed camera to determine the changes in the spin state of the rubidium atoms. They can therefore obtain a two-dimensional image of the entire measuring cell within a few milliseconds and can then use this to compute the microwave field in micrometer resolution. This method even allows the researchers to produce short videos of the field. Professor Patrick Maletinsky's team measures the spin change of individual electrons in a nitrogen vacancy center in diamond in order to obtain an image of the microwaves' magnetic field. For this purpose, the researchers initially produce a tiny tip made of monocrystalline diamond. This diamond is modified so that some carbon atoms in the crystal lattice are replaced with nitrogen atoms and a vacant site is located immediately adjacent to these (nitrogen vacancy centers). This tip is then incorporated into a specially developed microscope and moved into the direct vicinity of a microwave field. Mirroring the results from the Treutlein group, the angular velocity of the electron spin in the nitrogen vacancy center is proportional to the strength of the microwave field. The entire sample is then analyzed point-by-point, and the microwave field is computed based on the change in spin. 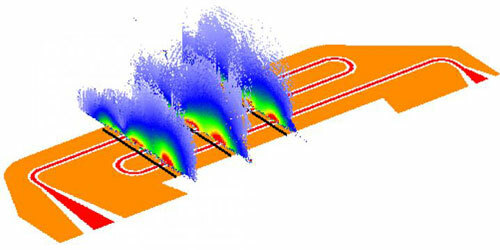 Because of this raster process, the analysis takes approximately an hour. It delivers high-resolution images on the nanometer scale - one million times smaller than the wavelength of the microwaves.